The shipping containers beneath Mancunian Way will have retail, rooftop terraces and entertainment spaces. 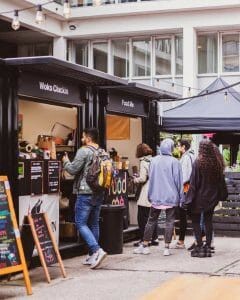 Award-winning food, drink and retail pop up destination Hatch, based in Manchester’s Circle Square, has revealed plans for an exciting expansion which will see the market treble in size. A spokesman for Hatch said the development will be unveiled in June and will see the scheme grow from 2,480 sq ft to 11,840 sq ft. Spreading out right underneath the Mancunian Way, creating an extraordinary new urban destination to explore right in the heart of the city. The spokesman said the market will evolve into a multipurpose, creative village of food, drink, retail, entertainment, roof terraces, creative workspace, public use and event spaces made up of multiple zones. 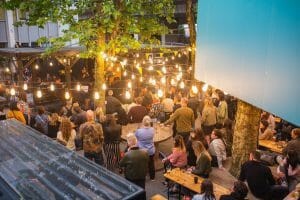 In addition to the existing Hatch open-air courtyard (home to four frequently changing street food traders and anchor brands Takk and ÖL Nano Brewery & Bar), Hatch Phase Two will make room for a killer line up of even more independent food and drink brands. 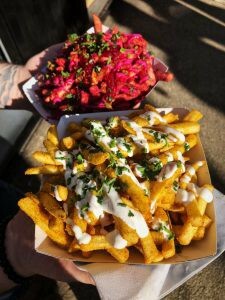 These will be situated underneath the Mancunian Way, creating a new food and drink village of kiosk-style street food, as well as larger, more permanent restaurant and bar operations. 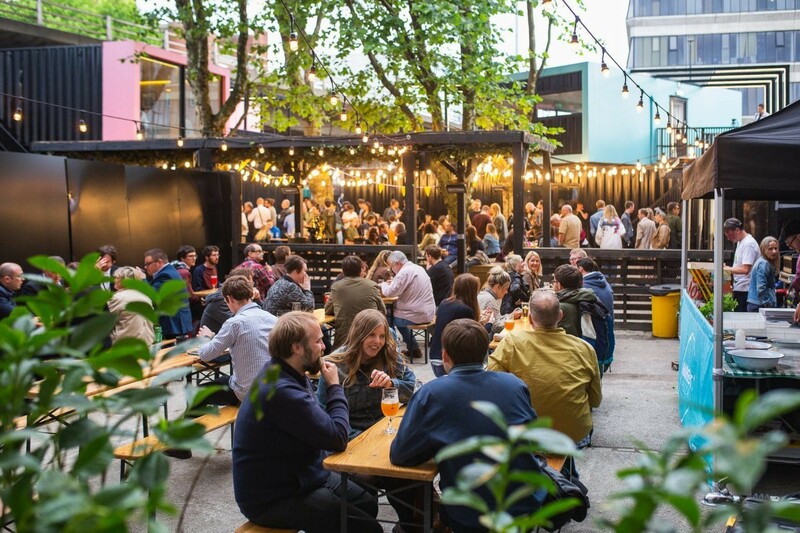 All will be housed in Hatch’s trademark shipping container units creating Manchester’s biggest semi-permanent street food destination, open from morning through to night. Amongst the new and exciting food operators set to pop-up up in Hatch’s extended street food arena is Hanoi 75. They’ve converted a 1999 double-decker bus into a fabulous Vietnamese kitchen serving up a creative menu of cuisine from Vietnam’s capital city fused with other influences from South East Asia and all centred around the beautiful Bahn Mi! Expect fresh, fast Vietnamese sandwiches to take away, enjoy on the bus or anywhere at Hatch. The development will also include a new shopping zone featuring 10 new containers installed with independent retailers and designers in mind. A range of exciting and innovative brands will join Hatch’s successful anchor retail trader, Nordic Muse. Expect to see some familiar faces in the new line-up as ex Hatch retail favourites including vinyl specialists Stutter & Twitch will be popping back up along with some new faces. The Hatch Phase Two evolution will include the development of its own creative community with the addition of workspace and studios. These spaces will be home to creative independent businesses, makers, designers and artists who need affordable, flexible (and unique) work space. Hatch’s new industrious zone will be a collaborative new community in the heart of the extended Hatch neighbourhood. Hatch is all about supporting new ideas — collaborating with unique, independent brands to create something special and different that everyone can enjoy. 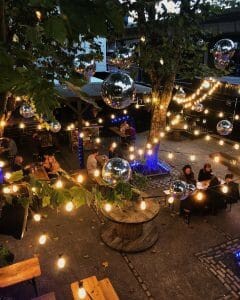 That’s why the newly extended version of Hatch is inspired by the most welcoming of festival atmospheres, complete with lots of cosy indoor and outdoor places to hang out or explore; twinkly lights; public art for all; and constantly changing areas to give visitors a new experience every time they visit. There’ll be lots of free public spaces to use — places to enjoy a Manchester morning over an excellent coffee, to watch the sun go down over cocktails and incredible food, to catch up on emails in an inspiring setting, to study or just to take a mindful moment and soak up the atmosphere. There’ll be a stage, rooftop DJ terrace, and multipurpose event space where people will be able to come together and enjoy live experiences and events — from music and gigs to community gatherings and who knows what else. Hatch may be getting bigger this summer, but it will remain independent, inclusive, disruptive, welcoming… and always for the curious.